It's time for another wonderful color challenge at the CR84FN Blog! Thanks so much to those who played along with our last challenge! 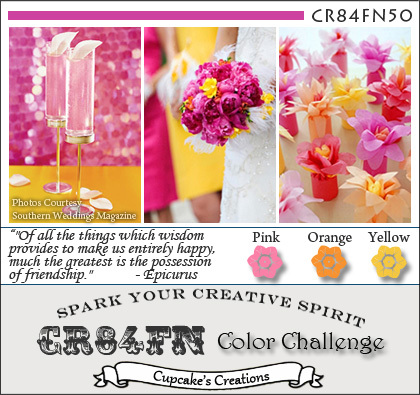 This next challenge will run from Sunday, March 11th - Friday, March 30th, using the colors Pink, Orange and Yellow. Shannon will be joining us again as our Guest Designer, and I also wanted to let you know that Stephanie will be stepping down from the CR84FN DT after challenge 50. Stephanie's wonderful contributions will be missed, and we wish her all the best with her future creative endeavors! There's always one who stands out in the crowd, and this week it's my SpringPunk card using images from the Diesel Punk, Happiness and Industrial Chic plates from Artistic Outpost, along with this weeks colors. I had some scraps of Bo Bunny paper left over from this project, and used the reverse side on this card, as there are light splashes of Pink and Yellow on the paper. All images are stamped on the pattern paper, the car and Diesel Punk Kid are colored with STAEDTLER Karat Aquarell Watercolor Pencils, blending with Gamsol. The Butterfly Wings (Artistic Outpost Happiness plate), are stamped on Bo Bunny Pattern Paper, cut out and adhered in place. The gears (Industrial Chic) are randomly stamped in Ranger Monarch Orange Ink. Here's this weeks color inspiration, we'd love for you to play along with us at CR84FN, you can find all the details here on how to enter. If you upload to any online gallery please use keyword CR84FN50 so we can find your creations! PS - the winners from the Creations by AR DT Blog Hop are Monica (Hutch Template) and Chana ("ES" in the Bag Template), please email me to claim your prize. Love your take on springpunk! Awesome. Have a great weekend! What a fun Vintage card Lisa! That little Diesel Punk Kid is a doll! Love the pink coat and butterfly wings! What a fab fun card Lisa! Love the vintage steam punk vibe, really cool design! Love this card - it's a super image and a great sentiment! I really like the steampunk theme! Fun & Funky! I always think browns with the steampunk and love how you went bright and happy with the colors. Love the wings you gave the little girl! This is a keeper, fer sure! What an adorable springpunk card. Oh my goodness I love this card Lisa!! I have that same saying on a charm in my car! My mother gave it to me. The steampunk theme here is wonderful! Thanks for sharing. Wonderful card, love the saying. Love this Lisa! I love those butterfly wings behind the cutey! Awesome! Super card, Lisa. Love the gears and your winged "driver!" So fun and wonderful, Lisa! LOVE that image and her wings! Thanks so much for your kind words! I hope we will stay in touch in blogland! This is w-a-y cool ... love how you've colored the fairy girl ... she looks fab!! OMG, she is so stinking cute and I love the wings! Lisa, LOVE LOVE LOVE this sentiment and the wings just really make this card! LOVE also how you stamped the random gears! Great card!